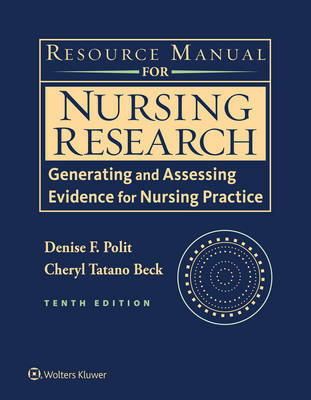 Nursing Research: Generating and Assessing Evidence for Nursing Practice, 10th Edition has been updated to incorporate new methodological advances and, to the extent possible, substantive examples used to illustrate concepts will be from articles published in 2013 to 2015. The organizational structure introduced in the 9th edition will be maintained  i.e., content focusing on quantitative research will be in Part III, and content on qualitative research will be in Part IV. The textbook package will include the book itself, a Resource Manual, and a digital Toolkit with high-quality forms and tools (in Microsoft Word) that new researchers can modify or use directly (e.g., informed consent forms, demographic questionnaires. Additional useful material will be added to the Toolkit, including links to open-access papers on the topic covered in each chapter. A valuable ancillary package is available for instructors and students via thePoint. They include PowerPoint slides with relevant tables and figures, test bank, journal articles, case studies, critical thinking exercises, strategies for effective teaching, internet resources, and glossary. Features: - A Crossword Puzzle. Terms and concepts presented in the textbook are reinforced in an entertaining and challenging fashion through crossword puzzles. - Study Questions. Each chapter contains several short individual exercises relevant to the materials in the textbook. - Application Exercises. These exercises are designed to help you read, comprehend, and critique nursing studies. These exercises focus on studies in the appendices and ask questions that are relevant to the content covered in the textbook. There are two sets of questionsQuestions of Fact and Questions for Discussion. The Questions of Fact will help you to read the report and find specific types of information related to the content covered in the textbook. For these questions, there are "right" and "wrong" answers. For example, for the chapter on sampling, a question might ask: How many people participated in this study? The Questions for Discussion, by contrast, require an assessment of the merits of various features of the study. For example, a question might ask: Was there a sufficient number of study participants in this study? The second set of questions can be the basis for classroom discussions. - Toolkit . This section, found online on thePoint, includes tools and resources that can save you timeand that will hopefully result in higher-quality tools than might otherwise have been the case. Each chapter has tools appropriate for the content covered in the textbook.